Did you manage to guess what healthy dish my family was cooking in the previous HPB post? Cooking healthily does not mean having to eat bland food. It simply means making better choices of what ingredients and what methods of cooking to use. I am happy to share this easy-to-do one pot dish (so no need to do too much washing! Moohehe). 1) Heat a dry pot on medium heat for about 1 min. 2) Add in ginger slices to the pot, ensuring they do not overlap each other. 3) After 1 min, flip the ginger slices over and toast the other side for another 1 min. 4) Add in 2 litres of water, prawn shells and the fish bones to the pot and bring to the boil. 5) Once boiling, lower the heat and simmer for an hour with the lid of the pot slightly ajar. 6) Remove the prawn shells, ginger slices and fish bones. 7) Add in tomato wedges and increase to medium heat. 8) After 10 mins, add in beancurd and fish slices. 9) 2-3 mins later, add in the spinach and prawns and cook for another 3-5 mins. 10) Season the soup with a dash of low sodium soy sauce, ground white pepper, sesame oil and Huatiao Jiu to taste. Boiling is a healthy way of cooking as it does not require oil. It also produces a delicious stock from the natural flavours of the ingredients used. Fish bones and ginger give a really tasty stock without the need for adding powdered soup stocks and artificial flavour enhancers. Adding fruits and vegetables to your diet provides vitamins, minerals, fibre and phytonutrients, not to mention colour! Here, spinach is rich in iron, vitamins A, C, E and calcium. Tomatoes contain lycopene, a powerful antioxidant, and potassium etc. Prawns are a low-fat, low-calories good source of protein (beating good ole chicken!). They also contain omega-3, selenium and zinc among other healthful goodies. Enjoy a satisfying bowl of seafood soup at home. Cooking it at home means I know and can control exactly what goes into the dish and ultimately my family’s stomachs. Hope you will enjoy this recipe and dish at home with your family. Cooking healthily can be easy. Just be mindful and use healthier options along the way. It’ll soon be second nature to you! Check out HPB’s library of healthy recipes too! 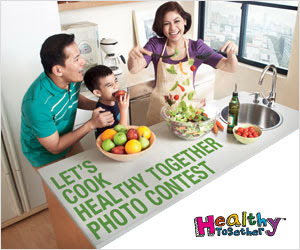 Chew On This: Join in the Let's Cook Healthy Together Contest now and stand to win $3000 worth of NTUC vouchers! If your like crabs cooked in many styles, check out Plaza Brasserie's Sumptuous Crab Feast. ...to Nonya Curry Crab- flower crabs doused in a tasty sauce that was moore Indian than Nonya to me but nonetheless delicious. Diners who enjoy the fragrance and flavour of butter should try the Butter Crab. These mud crabs were stir fried in a sinfully rich butter sauce with curry leaves and red chilli. Finger-licking good. For something unique, opt for the XO Sauce Crab. The XO sauce with dried shrimp and scallops added a seafoody depth to the crabs. Oh and did I mention that all the above crabs are available on the buffet? Crabby people can whack to their hearts' content! Other buffet favourites are also available. How about Roast Pork Laksa?! I threw in 2 slices of roast pork into the laksa for a meatier fix. Moohehe. How much is the price of this buffet? Certainly not bad especially for those who can eat lots of crabs! Thanks to Karen of PARKROYAL for the invitation and for hosting this hungry moo. Chew On This: Hurry cos the Sumptuous Crab Feast ends 31 August! I like that cooking at home gives greater control over what goes into the food and eventually the stomach (very important for someone with 4 stomachs! Moohehe). Amounts and type of oil and salt can be moo-derated, and quantities of meat and veggies can be adjusted. Say bye bye to measly 2 leaves of chye sim or overly oily/salty dishes! Y-A-Y. From 13 August, the Health Promotion Board is organizing a Let’s Cook Healthy Together contest to encourage moo-re families to lead healthy lifestyles by cooking together at home. I think it’s a fun idea! - - Round up 2-4 family members. - - Cook a healthy dish together! - - From 13 August to 16 September 2012, snap and submit 2 photos- a fun moo-ment cooking with your family and the final dish. - - Submit the recipe with the names and NRIC numbers of your family members involved in the cooking. Stand to win attractive prizes with the first prize of $3,000 worth of Fairprice vouchers and a cooking class for a family of 4 at Cookery Magic! Winners will be announced on 28 September. Contest details are also available here and check out HPB’s Facebook to join the contest! Chew On This: contest for a healthy and fun time with your loved ones.